While the TV version of tournament poker features the dramatic race toward a single winner who takes home the top prize, the reality of most daily tournaments is that deals to divide the remaining prize pool are often made long before a single winner is identified. At the final stage of most tournaments chance plays a significant role in outcomes, as the low number of blinds each player has remaining forces frequent all-in confrontations. A chop is thus often the best option for achieving one’s best-case outcome. In order for a chop to occur, ALL remaining players must agree on a deal. Otherwise the game is played down to the bitter end, or if your cardroom has a closing time and the game is not over, the floor gets to divvy up the money for you. It is a good idea to know the terminology and understand common standards if you are asked to make a deal. While an infinite number of possible deals could be made, here are the most common methods of chopping the prize pool (ordered from the least sophisticated to the most). To see how each would play out, let’s imagine a scenario with 4 players remaining with chip counts of 400,000, 300,000, 200,000 and 100,000. The payouts for the top 4 spots are $1,600, $1,000, $600, and $400. Even Chop of Remaining Prize Pool. In this scenario, players sum the payouts remaining and divide by the number of players left. In our example the prize money sums to $3,600, so each player would get $900 ($3,600/4). At smaller card rooms with aggressive blind structures this is a common practice, especially when no one has a dominant chip stack. Late in a tournament with an aggressive blind structure everyone is in shove-or-fold mold and the chip lead can swing wildly. People who propose such deals will frequently say “Everyone ends up with close to second place money and anyone could win at this point.” The advantages of this chop are its simplicity (new players sometimes get lost in more complicated chop offers) and perceived fairness. The drawback is that an even chop does not reward the players who have built larger stacks and will sometimes elicit pushback from those players who feel they should be rewarded for their performance up to that point. A variation of this chop is to give the chip leader(s) slightly more than a completely equal share. In the above example, someone may say “OK, how about the chip leader gets $1,005 and the remaining 3 get $865”? Each of the 3 players only yields $35 compared to the even share scenario, but the big stack feels better that she ends up with $140 more than everyone else. Even Share, with Play Down for Remainder: When some stacks are notably bigger than others, and if one or more of those players view themselves as the strongest players remaining, there is an understandable reluctance to pass on an opportunity for top prize money. In this case, you can offer an even chop of a portion of the prize pool and allow the tournament to play out for the rest. In our example with $3,600 remaining in the prize pool, all 4 players might receive $700 (for $2,800 of the $3,600) and then agree to play down for the remaining $800. In this scenario, all 4 players are assured better than third place money, but someone who really wants to go for the top money can still win $1,500 ($700 from the chop and $800 held aside), only $100 off the top place finish. This chop has appeal for both the players who want to insure a solid payout and the players who want to go for max money. The disadvantage is that sometimes it takes some explaining to players who have never been confronted with such an offer to get everyone to agree. Chop Based on Raw Size of Current Chip Stacks: One method of dividing the money with a recognition of stack size is to give everyone the portion of the prize money consistent with their current proportion of the chips in play. In our example, the chip leader has 40% of the chips in play (400,000/1,000,000) thus she would receive $1,440 ($3,600 X .40). The second chip leader would get $1,080 ($3,600 X .30), the third gets $720 ($3,600 X .20), and the fourth $360 ($3,600 X .10). Although on the surface this may appear more fair than the previous two methods, at least for the chip leaders, the issues that arise are immediately apparent in our simple example. When there is notable spread in chip counts, the lowest chip stacks gain very little in this method. In our scenario the player in 4th place would actually lose $40 if they agreed to such a deal; they would be better off just going out in fourth. Even if they were somehow offered a bit more money to get them above $400, why would they agree to such a chop? This method fails to recognize that they have well above a 0% chance of finishing higher than fourth. In our scenario, the 4th place player is a currently out-chipped 4 to 1 by the chip leader. However, if he goes all-in in the next hand against the chip leader and wins, they are now at $300,000 and $200,000 respectively, completely shifting the ordinal structure. 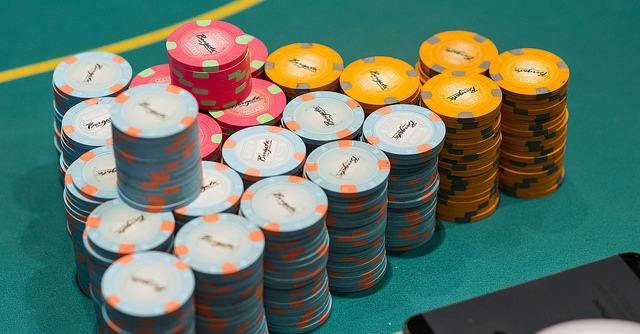 In a raw chip division by stack size the chip leader is being significantly over-compensated for his current status compared with the probable results. If the chip leader has 50% of the chips in play, this method would award them $1,800 - more than the actual first place money! If chip counts are closer to even, the impact of this chop method is lessened, but still tends to over-award the larger stacks. At that point a straight chop of the money as in strategy #1 is an easier and arguably more fair solution. Independent Chip Model (ICM) Chop: The most sophisticated, and likely fair, method of chopping is to give weight to current chip stacks, not as a raw figure but as a probability of each player’s likely average payout given the current situation. Put another way, ICM (which has wider applications in determining the value of chips in various stages of tournaments) assigns a cash value to each player’s current stack. A simple ICM chop calculator, such as the one available here at Advanced Poker Training, allows you to select the number of players remaining and enter their chip counts and the remaining payouts for each position. The calculator will then generate figures based on these factors, running them through the ICM probabilities. In our example, the payouts are $1,111, $997, $848, and $644 which substantially boosts the third and fourth place payouts, keeps the second intact, and pays the top stack more than the others. First place sacrifices enough equity to reflect the many scenarios in which she’ll finish second or third, or even last if things go badly down the stretch. The inherent advantages in the ICM approach are clear: it both recognizes the current situation and divides the prize pool based the true probabilistic value of each player’s chips in earning likely payouts. The disadvantages are that your card room needs to have someone capable of understanding and calculating these probabilities (major casinos generally do) and that players who have never heard of ICM may be challenged to understand how it is a more equitable solution than an even chop. The former problem can be solved by handing the floor your smartphone with the APT calculator cued up. The latter may be more of a challenge, and rely on your communication skills and ability to explain the concept. Any of the above methods can be utilized to chop up a prize pool. Perhaps the best advice when proposing a chop is to stay calm, patient, and logical throughout the negotiation, and to be flexible in hopes of getting close to an equitable result. If someone does not understand your proposal, take the time to explain what is being suggested and why. If someone steadfastly refuses to agree to a chop, move on, don’t get mad (many of the players will get mad, very mad), and understand that is the player’s right. However, also understand that regulars at card rooms track who has been agreeable to fair deals in the past and who has not. If you are the holdout, don’t be surprised if you experience resentment from the other players. Also understand that if you are the short stack in a potential chop situation in the future, and have been the stubborn big stack previously, someone might say “I’d rather wait a bit” when a chop is proposed. As soon as you bust and walk away from the table, you’ll hear “OK, now I’ll chop”!